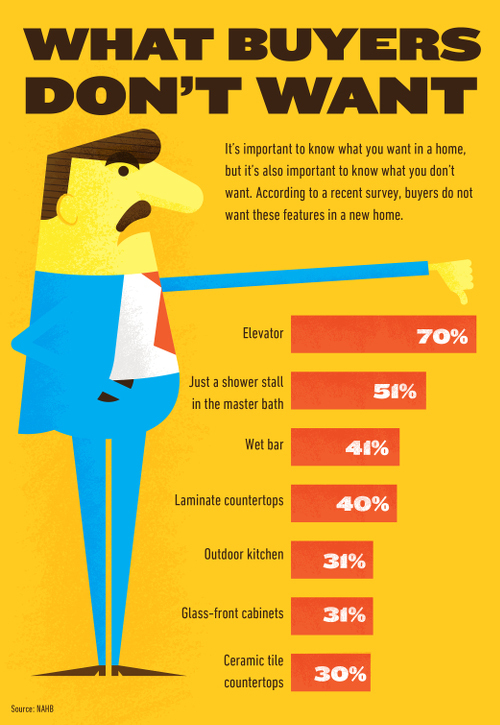 National Association of Home Builders’s consumer study, “What Do New Home Buyers Want,” takes a comprehensive look at what’s hot and what’s not among prospective home buyers. The 2013 survey was conducted at the tail end of a protracted housing recession that affected not only the number of new homes that are built each year, but also the characteristics and features of the ones that do get built. The single-family detached home remains the solid favourite to seven in 10 prospective new-home buyers. Purchasers of new homes want larger houses with lots of space. However, when asked to choose between a bigger house with fewer amenities or a smaller house with high-quality products and amenities, 63 percent of the homeowners surveyed by NAHB opted for the latter. To pay for those quality features, 57 percent said they preferred for them to be included in the base price of the home; while 43 percent wanted them to be offered as options at extra cost. 74 percent of NAHB’s survey respondents especially prefer large kitchens adjacent to family rooms and want the two rooms to be visually open or divided with a half wall. They want modern features like high ceilings and island work areas in the kitchen. Of 18 different kitchen features, a walk-in pantry topped the list, with 78% of respondents rating it as desirable or essential. After a walk-in pantry, respondents most favoured island work areas (71%) and light wood cabinets (59%). The number of bathrooms that is typical of homes being built today is sufficient for most home buyers. Asked to choose between more space in the master bedroom and less in the master bath or the opposite, 69 percent chose more bedroom space. A linen closet topped the list of desired bathroom features, with 88% of the respondents categorizing it as essential or desirable. Other desirable features included an exhaust fan (86%) separate shower enclosure (69%), water temperature control (67%), a whirlpool tub (58%) ceramic tile walls (55%) and a dressing room/makeup area (52%). Laundry rooms and dining rooms are widely considered to be essential in new homes. Younger households prefer their washer and dryer to be located near the bedroom; older households prefer them near the kitchen. Home shoppers were divided over the preferred location for their clothes washer and dryer, with 26% preferring a location near the bedrooms, 26% near the kitchen, 23% in the basement and 10% in the garage. Respondents were divided over the question of whether the master bedroom should be on the first floor or second floor. Fifty-two percent opted for a master bedroom on the first floor and 48% opted for a second-floor location. Most respondents strongly preferred one master bedroom suite and three standard bedrooms over two master suites with only one other bedroom. Regarding extra rooms for convenience and luxury, 92% of respondents wanted a laundry room, 79% wanted a dining room, 58% wanted a home office, 54% wanted a den/library, and 46% wanted a sunroom. Media rooms (28%) and exercise rooms (29%) were not as popular. They are also very interested in exterior features such as a front porch, deck or patio in the rear, and exterior lighting. Continuing a trend identified in previous NAHB studies, many home buyers do not think it is necessary to have a separate living room. One-fourth of respondents said that they wanted at least a three-car garage, even considering the extra cost. The majority of respondents (54%) would settle for a two-car garage. The people surveyed were frequently concerned about storage space, with only about one-third rating general storage space as adequate. However, four of the top most wanted features involve saving energy: 94% of home buyers want energy-star rated appliances, 91% want an energy-star rating for the whole home, 89% want energy-star rated windows, and 88% want ceiling fans. Home technology features buyers would most like to have: wireless home security systems (50 percent), programmable thermostats (47 percent), security cameras (40 percent), Lighting control system (39 percent). Only a shower stall in the master bath (51 percent).